Recently Delhi University Academic Council (Oct 2011) decided to drop the scholarly essay “Three Hundred Ramayanas” of A.K.Ramanujan, on different telling of Ram’s story from the syllabus of ‘Culture in India’ for BA Honors students. Of the four experts on the committee, one of them, whose opinion was finally accepted, said that undergraduate students will not be able to tolerate the portrayal of divine characters in the different versions given in the essay. In response to the ban while Akhil Bhartiya Vidyarthi Parishad, which is an affiliate of RSS, and company celebrated, the staff and many students protested against this ban. Just to recall earlier in 2008 ABVP activists had protested against the introduction of this essay, and indulged in vandalism on the issue. This essay by the much acclaimed scholar, A.K.Ramanujan is part of his "The Collected Essays of A.K.Ramanujan (Oxford 1999). Earlier in the aftermath of Babri demolition, a Sahmat exhibition on different versions of Ramayana was attacked by RSS combine's goons in Pune in 1993. This was done on the pretext that one of the panels based on Jataka (Buddhist version) showed Ram and Sita as brother and sister, and it is an insult to their faith. Ramanujan's essay talks of different versions and presents five of them as an example. It is known that there are hundreds of versions of Ramayana, Buddhist, Jain, Valmiki etc. 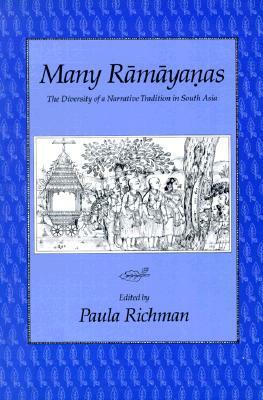 Paula Richman in her book Many Ramayana's (Oxford) describes several of these. And again there are different interpretations of the prevalent Valmiki Ramayana, many of which are not to the liking of those who are indulging in politics in the name of their faith. Surprisingly all this intolerance is shown by those who assert that Hinduism is tolerant and other religions are intolerant. It is a fascinating exercise to go through various tellings and interpretations of Ramayana. Even the other renderings acceptable to this intolerant but currently dominant political force are not uniform. Valmiki, Tulsidas and later the one adopted by Ramanand Sagar for his serial Ramayana have their own subtle nuances, which are very different from each other. Ramayana has been rendered in many languages of Asia in particular. Ramanujan points out that the tellings of Ram story has been part of Balinese, Bengali, Kashmiri, Thai, Sinhala, Santhali Tamil, Tibetan and Pali amongst others. There are innumerable versions in Western languages also. The narrative in these is not matching. Those opposing this essay take Valmiki as the standard and others as diversions which are not acceptable to them for political reasons. The version of Ramayana, the communalists want to impose has the caste and gender equations of pre-modern times so it is hung up upon only that version as the only one acceptable to it. Interestingly one can see the correlation between the class-caste aspirations of the narration-interpretation. In Buddhist Dasharath Jataka, Sita is projected both as sister and wife of Ram. As per this version Dashrath is King not of Ayodhya but of Varanasi. The marriage of sister and brother is part of the tradition of glorious Kshtriya clans who wanted to maintain their caste and clan purity. This Jataka tale shows Ram to be the follower of Buddha. Similarly Jain versions of Ramayana project Ram as the propagator of Jain values, especially as a follower of non-violence. What do both Buddhist and Jain versions have in common is that in these Ravan is not shown as a villain but a great spiritual soul dedicated to quest of knowledge, endowed with majestic commands over passions, a sage and a responsible ruler. Popular and prevalent "Women's Ramayana Songs" of Telugu Brahmin Women, put together by Rangnayakamma, keep the women's concern as the central theme. These songs present Sita as finally victorious over Ram and in these, Surpanakha succeeds in taking revenge over Ram. In Thai Ramkirti, or Ramkin (Ram's story), there is a twist in the tale and Shurpanakh's daughter decides to take revenge attributing her mother’s mutilation primarily because of Sita. More interestingly here the focus is on Hanuman, who in this telling is neither devout nor celibate but quite a ladies’ man, looking into the bedrooms of Lanka. In Valmiki, Kampan and Tamil tellings Hanuman regards seeing another man’s sleeping wife as a sin, but not in this Thai version. Incidentally he is a very popular Thai hero even today. Also like Jain Ramayana this Thai telling focuses on genealogy and adventures of Ravana and not of Ram. In recent times Jotiba Phule who stood more with the interests of Dalits and women, was amongst the first to interpret this mythological tale from the perspective of those subjugated by caste-varna-gender hierarchy. Phule points out that upper castes were descendents of conquering Indo-Europeans who overturned the original egalitarian society and forbade the conquered from studying texts. His mythology is woven around King Bali, who could invoke the image of peasant community. Needless to say his murder by Lord Ram from behind is condemned and is seen as an act of subjugation of lower castes by the upper castes. And Ram is seen as an avatar of Vishnu out to conquer the land from the Rakshasas (those protecting their crops) for establishing the hegemony of upper caste values of caste and gender hierarchy. Dr. Ambedkar and Periyar's commentaries are more an alternative reading of the Valmiki's text rather than a separate version. There is a good deal of overlap in the interpretation of both. Dr. Ambedkar focuses his attention on the issues pertaining to Ram's killing of Shambuk for violating the prevalent norm where a low caste has no right to do penance, tapasya. Like Phule he also castigates Lord Ram for murdering the popular folk king Bali. He questions Ram's act of taking Sita's agnipariksha, trial by fire, and his patriarchal attitude towards her. After defeating Ravan he tells Sita that he had done all this battle not to get her released for her own sake but to restore his honor, and his banishing her in response to the rumors about her chastity when she was pregnant comes for severest criticism from Ambedkar. Periyar is basically taking the same line but in his interpretation the North Indian upper caste onslaught-South Indian resistance becomes the central theme. 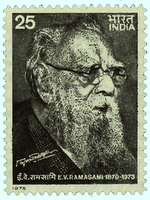 Periyar the initiator of ‘Self Respect Movement’ was the pioneer of caste and gender equality in Tamilnadu. In one of the movements, which is very less known, on the lines of Dr. Ambedkar burning Manusmriti, he planned to burn the photo of Ram, as for him Ram symbolized the imposition of upper caste norms in South India. This was a part of his campaign against caste Hinduism. Periyar also upheld Tamil identity. According to him the Ramayana story was a thinly disguised historical account of how caste ridden, Sanskritic, Upper caste North Indians led by Ram subjugated South Indians. He identifies Ravan as the monarch of ancient Dravidians, who abducted Sita, primarily to take revenge against the mutilation and insult of his sister Surpanakha. In his interpretation Ravana is practitioner of Bhakti, and is a virtuous man. It seems the dropping of the essay from syllabus is under indirect political pressure of communal forces. RSS and affiliates who have reaped rich benefit from the campaign around Lord Ram are also giving the political message of caste and gender hierarchy, through the version upheld by them, the one of Valmiki and presented in current times by Ramanand Sagar’s tele serial Ramayana. And the politics claiming to be tolerant is intolerant about scholarly renderings of ‘Many Rams: Many Ramayanas’ prevalent World over!